The financial crisis, which struck worldwide in 2008, had forced many countries to review their existing financial system and modify it with some new ideas. The financial policy makers of India can withstand the liquidity pressure but fail to deal with the global bankruptcy problem especially in US and UK. There was not a suitable framework in India to combat with the bankruptcy. The situation compels the Govt. to bring out a Bill which can deal with the bankruptcy in both of the financial and non financial Sectors of India. Just like the Bankruptcy Bill 2016 for the non financial sectors, Govt. of India has introduced the Financial Resolution and Deposit Insurance Bill, 2017 for the financial sectors. The FRDI Bill deals only with the financial companies like banks and insurance companies. The Insolvency Code Act is applicable with the companies in other sectors .The main purpose of the Bill is to create a resolution for the financial sector companies at the time of crisis not putting extra burden on the tax payers. A committee headed by Mr. Ajay Tyagi under the Ministry of Finance drafted the Bill and it is approved to be introduced in the Parliament by Prime Minister Narendra Modi. The FRDI Bill has several important features. 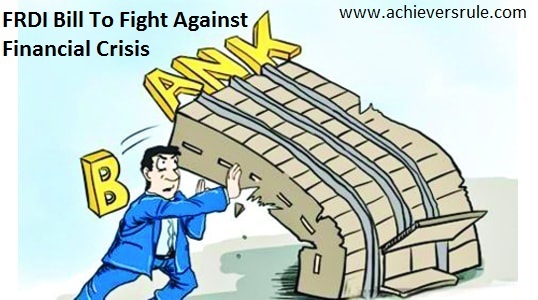 It protects the customers of financial sectors like Bank and insurance companies at the time of financial distress. It helps to maintain disciplines in the financial sectors by setting a limit to use the public money at the time crisis to bring back the distressed entities at the time of emergency. It will help to maintain financial stability of the economy by setting up essential preventive measures. It aims to strengthen the current framework of deposit insurance to benefit the retail depositors. It must work to decrease the time and cost involved to resolve the financial entities under distress. As a result of the Global Financial crisis, a resolution corporation is made. The corporation will cover all the firms which are regulated by RBI, PFRDA, SEBI, IRDA etc. It must protect the stability of the particular financial firm, consumer interests and public funds. It must build a proper functioning mechanism and provide guidelines to manage the affairs of a distressed financial institution by liquidating or reconstructing it without hampering the public interest. There are many advantages of the Financial Resolution and Deposit Insurance Bill, 2017. Reduced time and cost will benefit retail depositors. Planned preventive measure will help to maintain financial stability at the time of crisis. Increased access to finance will help in the growth of enterprise. As a result, more employment, growth of economy and new job opportunities will be created.